Why are clonal Paradox walnut rootstocks important to growers? Paradox clones provide options to manage orchard site specific problems or issues. Many growers are already quite familiar with the clonal walnut root-stock attributes since thousands of acres have been planted over the last seven years. Commercially available Paradox clones include Vlach, VX211, and RX1. Vlach has been available since 1999 and came from a vigorous Paradox tree in Stanislaus County. Originally identified as superior seedlings and then cloned, VX211 and RX1 were released by UC and USDA in 2007 after years of evaluation for vigor, resistance to nematodes, crown gall, and Phytophthora. These clonal Paradox rootstocks are readily available through the walnut nursery trade and sold either as potted rootstock that is fall budded or spring grafted in the field, or as a June budded or nursery grafted bare root tree. Crown gall: Several rootstock field trials surveyed 2012-14 for crown gall caused by Agrobacterium tume-faciens, (reporting on two below). In a trial in Tehama County, RX1, VX211, and Vlach had significantly lower incidence of crown gall and galls were smaller than Paradox seedling trees. There was no crown gall found on RX1. In a trial in Stanislaus County planted in 2000, Vlach (the only commercial Paradox clone available) had significantly lower crown gall incidence and galls were smaller than Paradox seedling trees. In more recent greenhouse screening trials, RX1 had the lowest incidence of crown gall. 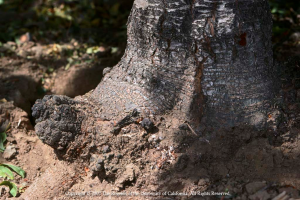 Phytophthora: In a trial in San Joaquin County where Phytophthora cinnamomi, a cause of root and crown rot, was present, all the trees on RX1 survived but there was extensive mortality of seedling Paradox trees. For more information on disease resistance ratings and mechanisms of the Paradox clones, see the bulletin on walnuts in the nursery trade, how they are propagated and understanding the terminology. Managing vigor during training on clonal Paradox rootstocks. Where clonal Paradox is being planted and conditions will likely lead to excessive vigor (for example, virgin tree ground, deep loamy soils or high nitrate irrigation water), avoid pushing the growth by over irrigating or fertilizing. Overly-vigorous growth has led to serious management and training problems in many new orchards recently. Nitrogen, in addition to what may be in irrigation water, may not be needed on first or even second leaf walnut trees on clonal Paradox. This can be confirmed by taking a July leaf sample. Use stem water potential monitoring to keep trees growing at a reasonable pace by making sure trees are not at or wetter than the baseline at any time. To slow trunk growth where excessive, keep side shoots longer during the summer. 1) Paradox. Many growers still prefer seedling Paradox although they are very susceptible to crown gall disease. USDA/UC researchers developed methods for nurseries to use to prevent infection by the bacterium during the seed collection phase and other practices which can alleviate crown gall from developing. See the article “Points to Consider in the Prevention of Crown Gall”. 2) Black walnut. Many growers have planted black walnut in recent years because it is less susceptible to crown gall than Paradox seedling rootstock. However, vigor is only moderate especially on poorer soils, and in UC trials, yields were lower compared to trees on Paradox rootstocks. Black walnut rootstocks have a place where there are salt problems because they are more tolerant than Paradox seedlings or clones. Potential new clonal walnut rootstocks with disease resistance. Over the last four years, USDA and UC researchers have developed several new clones with potential resistance to crown gall, nematodes, or Phy-tophthora. Field performance is being tested and compared to the standard Paradox clones VX211, RX1, and Vlach in five trials with the local UCCE farm advisors in Tulare, Sutter, Lake, Glenn and Solano Counties. Stay tuned.